Usually when you find a surprise in your laundry, it isn’t a happy one. Fortunately, this was not the case over the weekend, when I found an Arizona state quarter among those I was going to use to wash my clothes. 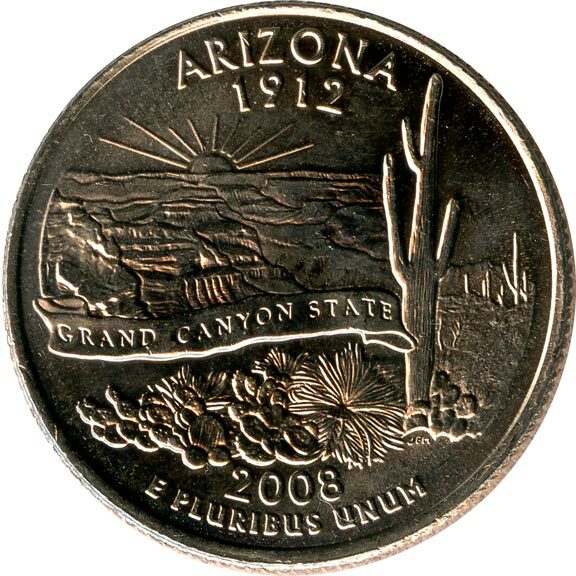 2008 is the first year for the Arizona quarter – I believe it is either the last or second-to-last round of state quarters. 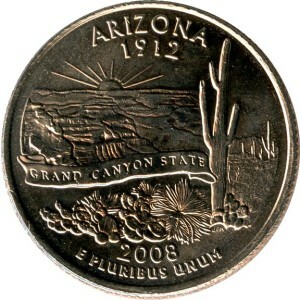 As far as state quarters go, I like the cut of its jib. The image fills the entire side, it is cohesive, and you can totally tell what it is. It’s nice they included a few different kinds of cactus; usually you just see a single lonely saguaro to represent Arizona. I’m also relieved they didn’t include a large ugly concrete wall running through the desert.